John Cabot University welcomed author Tyler Dilts as this year's Writer in Residence at the 5th Annual Summer Institute for Creative Writing and Literary Translation, held from May 19th to June 20th. The title is conferred each year during the Italian Feast of the Republic to those citizens who have distinguished themselves for their innovative contributions to the country's economy. John Cabot University President and professor of Political Science Franco Pavoncello was recently interviewed by the BBC News on the European Parliament elections in Italy. Born in Rome, International Affairs alumna Diletta Luminari, Class of 2014, is on her way to a Master’s in Migration Studies at Oxford University. President Pavoncello had the pleasure of welcoming Senator Lucio D'Ubaldo President of the ItaliaUSA Foundation, who was accompanied by the Secretary General of the Foundation. "Prof. Clough challenges students to produce their best work, supports them when things get difficult and above all else, inspires them to be better students and better people outside the classroom." The fourth and final exhibition in the series "Side by Side," curated by JCU Studio Art professor Serafino Monti, will be at the Galleria Monti & Company, from Tuesday, May 20 through Friday, May 30. A lecture by Laura Raimondo, Senior Vice President of the University of Pittsburg Medical Center (UPMC). A Communications major from Naples, Chiara De Luca graduated from John Cabot University in 2012. John Cabot University and the United Nations Interregional Crime and Justice Research Institute (UNICRI) are pleased to announce the third edition of the Summer School on Human Rights. Congratulations to Class of 2014 Valedictorian Victor Xavier Zarour Zarzar! 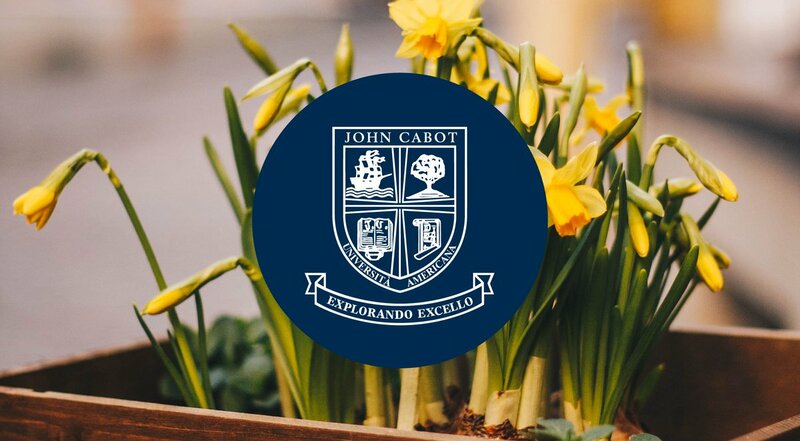 John Cabot University's Vice President and Dean of Academic Affairs Mary Merva is pleased to announce the Valedictorian for the Class of 2014 - Victor Xavier Zarour Zarzar. DITALS is a professional qualification offered by the Università per Stranieri di Siena for prospective teachers of Italian as a foreign language.